MY CRAFTS and STUFFS: Glory to God in the Highest! Taken from Luke 2:14, this verse and the image stamped were both from Sweet 'N Sassy stamps. 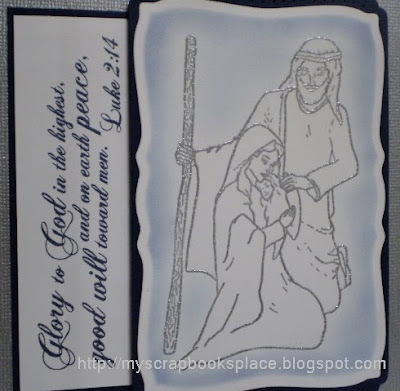 The verse is from their Christmas Scripture set and the image is from Jesus is Born set. I actually experimented on this as I was thinking of other colours to go with silver. So I decided to use SU! Night of Navy which I think looked well with my Bazzill Bling in silver. The image was stamped with Versacolor Silver and heat embossed with clear ep while the sentiment was stamped with Night of Navy ink. The image panel was cut using my Spellbinders Mega Curve Rectangles which I recently purchased from Bizzy Becs. Then while still inside the die, I then sponged some Bashful Blue ink and Night of Navy for more depth. My family and I weren't able to go to our Friday Bible study last night as I wasn't really feeling well. It's that time of the month and I was feeling so differently that I couldn't barely stand up because of the lower abdomen pain. I wasn't able to do anything from afternoon 'til night but lie down and praying that the pain would go away. I woke up in the middle of the night feeling a bit better..thank God! God bless us all and happy Saturday!